The CalPERS board last week tentatively approved an employer rate hike of roughly 50 percent over the next half dozen years, replacing a policy that kept rates low during the recession with a plan to reach full funding in 30 years. While giving unanimous “first reading” approval to the proposal by Chief Actuary Alan Milligan, the board asked for more information before final approval scheduled next month. “Any addition to the schools (rate) is likely to result in layoffs to employees,” said the board president, Rob Feckner, who represents the largest group of CalPERS members, non-teaching employees in 1,488 school districts. Feckner’s request for options for a “longer horizon” for phasing in the rate increase, softening the blow to employers, was joined by Treasurer Bill Lockyer’s representative, Grant Boyken, and board member Michael Bilbrey. The proposal for a new actuarial method would show state and local government employers the new rate plan in their next annual valuation report. But a five-year phase in of the rate increase would not begin until fiscal 2014-15 for state and school employers. The rate increase would not begin to phase in until fiscal 2015-16 for the local governments in the giant California Public Employees Retirement System, 1,567 public agencies with 2,044 retirement plans. The CalPERS funding level has not recovered from a $100 billion loss during the deep economic recession and, under the current rate policy, is not projected to reach full funding in 30 years. The CalPERS investment fund, expected to provide about two-thirds of future pension payments, peaked at $260 billion in the fall of 2007, dropped to $160 billion in March 2009 and was back up to $256 billion last week. 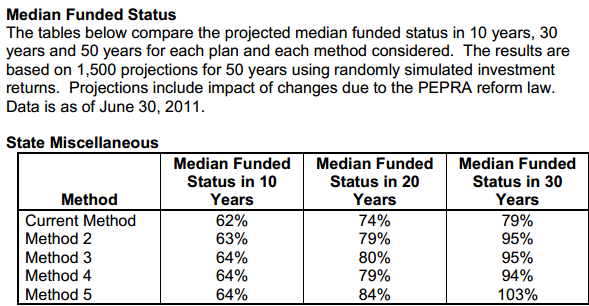 The total CalPERS fund had 101 percent of the projected assets needed to cover future pensions in 2007. The funding level dropped to 60.8 percent in 2009 and in the last valuation (as of June 30, 2011) was back up to 73.6 percent. Under the current rate policy, the funding level in 30 years is projected to reach 79 percent for most state workers, 86 percent for most local governments and 82 percent for non-teaching school employees. A funding level of 80 percent is adequate, some experts think. But CalPERS officials, shaken by the huge investment loss five years ago, worry that another deep recession could drop funding low enough to make reaching full funding impractical. Board member George Diehr said he was concerned that even with the proposed rate increase, the CalPERS funding level would still have a high probability of dropping below 50 percent in the next 30 years. “I think falling below 50 percent creates a high risk of political attacks, changes to the defined benefit (pension) system that might be not just what happened, the reform that was just passed, but more likely what happened in San Diego or San Jose,” Diehr said. Gov. Brown’s pension reform, AB 340, took effect in January, giving new hires smaller pensions and raising some employee contributions. Voters in San Diego and San Jose approved more sweeping pension reforms last June. Both measures attempt to cut pensions earned by current workers in the future. The San Diego measure switched new city hires from pensions to a 401(k)-style individual investment plan widely used in the private sector. 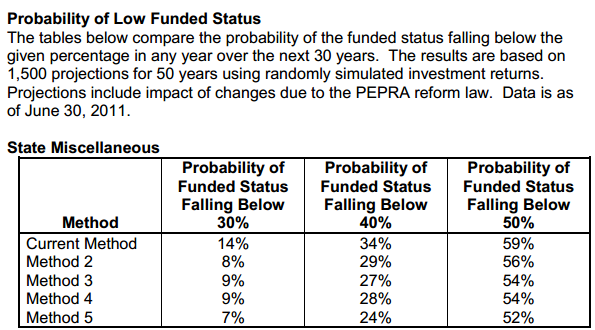 Even with the proposed new rate policy, the CalPERS funding level has a 52 percent probability of dropping below 50 percent during the next 30 years, according to 1,500 projections of randomly simulated investment returns. Diehr said CalPERS has been “too protective” of employers who raise pension benefits. He said employers should take the responsibility for any sharp increases resulting from higher benefits, whether through reserves or borrowing. “In the end, what it might come to, as the head of Human Resources in the city of Palo Alto has suggested, they may need to seek legislation to go after the other lever here that we can’t touch — and that’s the liabilities themselves, the pension benefits which drive the liabilities,” Diehr said. Milligan’s proposal would end the current complicated rate policy that uses a radical 15-year period for “smoothing” investment gains and losses, a “corridor” to limit smoothed values and rolling “amortization” that refinances debt each year. The chief actuary wants to use a “direct” policy that would determine the rate increase needed to reach a funding level of 100 percent in 30 years, then phase in the rate increase over five years. Under the five-year phase in (“Method 5” in the charts), the current employer rate for most state workers, 19.7 percent of pay, would increase to 29.2 percent, schools from 11.4 percent of pay to 18.9 percent, and public agencies from 14.9 percent to 23 percent. “Method 5 would produce the dramatic changes in CalPERS funding policy needed to protect the beneficiaries and reduce the long-term cost of benefits for all,” he said. Pellissier, a CalPERS pensioner with 24 years of service credit, said he was concerned the board had failed in its fiduciary duty to protect assets. His group unsuccessfully tried to put a pension reform initiative on the statewide ballot last year. CalPERS is considering other changes that could increase rates: Later this year completion of a risk-reduction study that may result in more conservative investments, and next year factoring in longer life spans and a review of the earnings forecast. At least one board member, J.J. Jelincic, disagrees with critics who say the CalPERS earnings forecast, 7.5 percent a year, is too optimistic and conceals massive debt. He asked Milligan for the probability of reaching 120 percent funding. Jelincic cited a 2011 report that the 100 largest corporate pension funds had an average earnings forecast of 8 percent. “Our return assumption is not unreasonable,” he said.